Well, this is certainly not the first time there’s ever been a little pun action in artwork inspired by Star Wars. 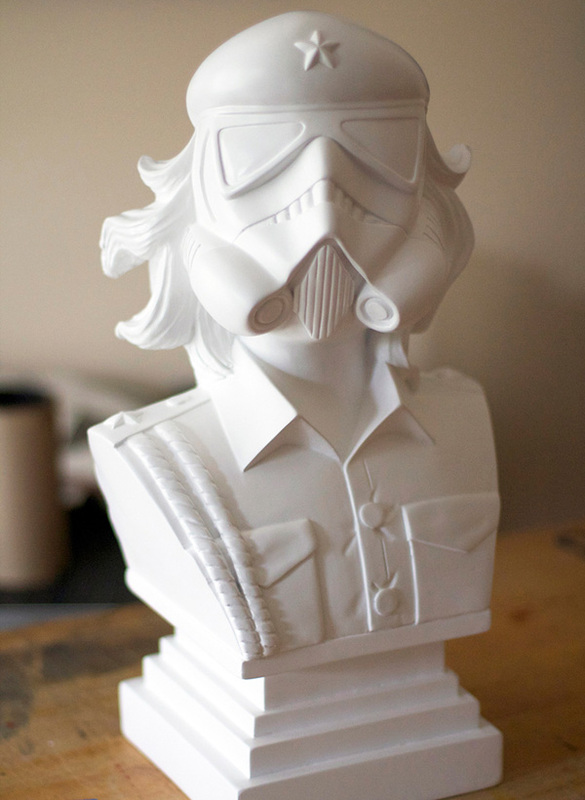 This time we’ve got Storm Guevara, or actually the resin bust is entitled Che Trooper by the artist and “guerilla marketer” that is Urban Medium. The bust figure, 18″ tall and weighing in at a little over nine pounds, emulates the hybrid of the legend of Latin America and the peon-worker-bee of the Dark Side. Hmm, an interesting juxtaposition when we put it that way. Super-duper limited edition of only fifteen pieces, and the artist promises to not only pack and deliver it safely, but to throw in some stickers. Wheeee! Stickers! Add this entry to the Death Star Diaries for $650.